With the heatwaves fading and 2019 starting to get rolling along we’re excited to bump into Valentines day again. Always a great time to indulge in some chocolate for a special someone (or yourself!) – here is our summary of four ways the Australian Chocolate World is celebrating Valentines day. It’s a lot of work to create a chocolate bar from scratch. The thought and effort involved in creating, testing and producing a new recipe is huge (plus the cost involved in creating custom packaging). So for a craft chocolate maker (the ones making bars from cacao beans) we LOVE when we see bars pop up for seasonal events. 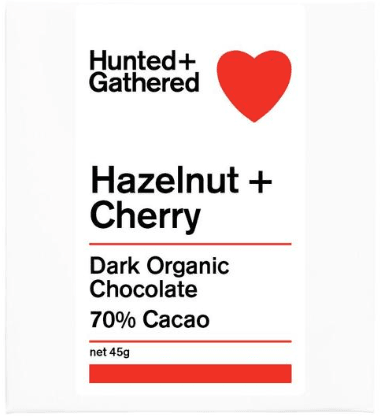 Hunted and Gathered have created a custom bar with roasted Hazelnut and freeze-dried cherries added to their great Dominican Republic bar. Ratio (also in Melbourne) have created a gorgeous gift box which is guaranteed to please. This custom box contains 3 of their bars. Don’t fret if you miss out on the special packet , it’s the bars that will win you eternal love. With all that’s in this special box from Mork chocolate but we’d buy it any day – these guys have one of the most amazing hot chocolate experiences in on the planet (and it’s in Melbourne)! Mork chocolate are also running a fabulous 3 course chocolate experience. Unfortunately places are all sold out – we suggest you follow them closely for the next opportunity. Some of these chocolate makers make their own chocolate for special chocolate bars but also buy commercial couverture chocolate for some bars / truffles. Check with them before you buy if that’s important to you (we think it’s okay for these kinds of products – consistency / predictability in tempering is important. Transparency with regards who made the actual chocolate is the key thing (if it’s not clear don’t be shy to ask). The latest addition to the foodie capital of Tasmania, Federation chocolate is looking after the Hobart romantics. This box of Alouss chocolate would be sure to please (Sydney based but may only be available online). These guys have 2 different valentines day gift boxes to choose from. The biggest bean to bar chocolate maker in Australia (some argue that once you get to this scale it’s no longer ‘bean to bar’ in the craft chocolate sense of the term but they make everything from the bean so it kind of counts.